A planetary nebula results when a star like the sun becomes a red giant and sheds its outer layers. 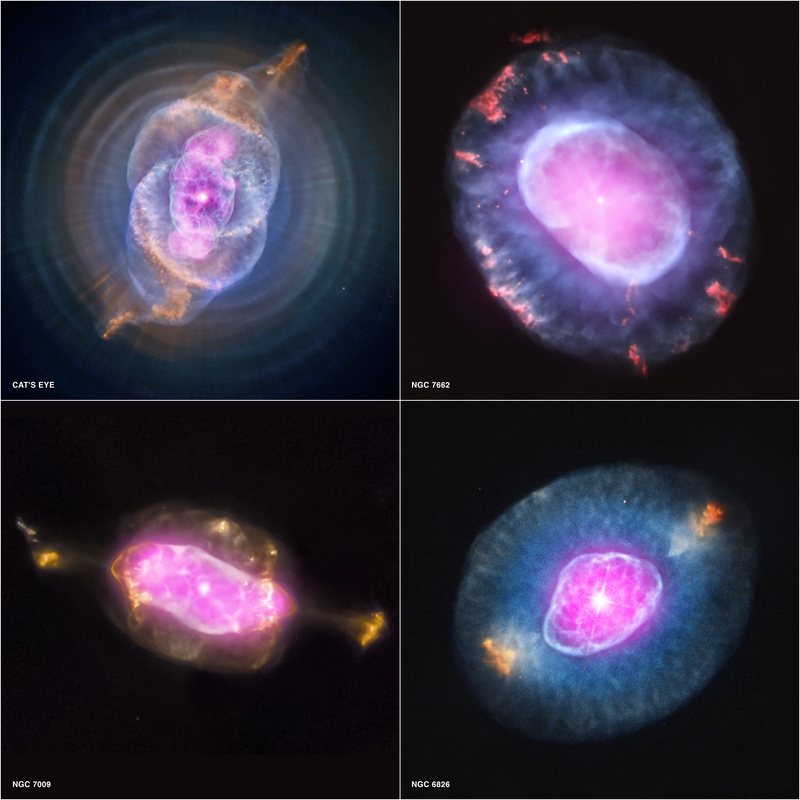 This gallery of four planetary nebulas shows Chandra X-ray data in purple and optical Hubble Space Telescope data in red, green and blue. The diffuse X-ray emission seen with Chandra is caused by shock waves as a wind from the hot remnant of the star collides with the ejected atmosphere. The four planetary nebulas are all located less than 5000 light years from Earth. These results were published in the August 2012 issue of The Astronomical Journal. The first two authors are Joel Kastner and Rodolfo Montez Jr. of the Rochester Institute of Technology in New York, accompanied by 23 co-authors. Coordinates (J2000) RA 17h 58m 33.30s | Dec +66'° 37' 59.20"
Coordinates (J2000) RA 23h 25m 63.60s | Dec +42° 32´ 06.00"
Coordinates (J2000) RA 21h 04m 10.90s | Dec -11° 21´ 48.30"
Coordinates (J2000) RA 19h 44m 48.15s | Dec +50° 31´ 30.26"
Thanks for your suggestion on the names. The nebulas have official names and sometimes they have nicknames. We were not responsible for either. To understand the properties of Supernova, one may need to understand the properties of Neutron matter and the various Quarks and axion matter that form a pasta. The electric-magnetic duality formed from such bulk ultra dense matter can explain the formation of the hour glass and bubble formations from droplets of condensed matter expanding. The above explanation by Chandra is very elementary and needs the understanding of modern day astrophysics. I loved it. We have been studying this and we estimate various things using the studies of nature's laws. But how can we be so sure about the dance of nature in a particular manner or in accordance to laws? We can show that laws are just the illusion of no law nature. So, whatever NASA or any other scientific organization studies and estimates about anything in nature cannot come true. What if nature is random and has no law? Maybe you should ask the public to name those nebula and than get a couple of poets to choose one. The one you call cat's eye is known as God's Eye. Please don't degrade these beautiful 'objects' by giving them these unimaginative names. Fantastic images, as if the star is to launch a net to capture his energy disperses over billions of years for a new beginning.